A SpaceX Falcon 9 rocket launches the first 10 Iridium NEXT communications satellites into orbit from Vandenberg Air Force Base in California on Jan. 14, 2017. SpaceX will use the same Falcon 9 rocket booster to launch another satellite from NASA's Kennedy Space Center in Florida on June 23, with another Falcon 9 launching from Vandenberg on June 25. SpaceX has delayed the launch of its next Falcon 9 rocket to at least Friday (June 23), setting the stage for a possible "weekend doubleheader," company representatives said this weekend. 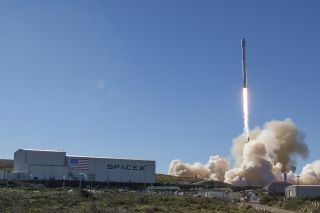 On Sunday (June 18), SpaceX announced it had pushed back the Monday afternoon launch of a Bulgarian communications satellite to no earlier than Friday so ground crews could replace a valve on the Falcon 9 booster. The delay means SpaceX will now launch a previously flown Falcon 9 rocket with the Bulgarian satellite (called BulgariaSat-1) from NASA's Kennedy Space Center in Florida, then launch another commercial satellite mission on Sunday (June 25) from Vandenberg Air Force Base in California. That Sunday flight will use a new Falcon 9 to launch 10 new satellites for the Virginia-based company Iridium, which is building a 70-satellite constellation for its Iridium NEXT mobile communications network. "Standing down on BulgariaSat-1 to replace a fairing valve, next launch opportunities are 6/23 and 6/24," SpaceX representatives wrote in a Twitter message Sunday. That note was quickly followed by another message: "Iridium targeted for 6/25—could be a weekend doubleheader." Elon Musk, SpaceX's CEO and founder, then chimed in on the possibility of seeing two SpaceX rockets launching in just a few days. "If schedule holds there will be two Falcon 9 launches within 48 hours (Cape & Vandenberg) this weekend," he wrote. SpaceX test fires the previously flown Falcon 9 rocket booster that will launch BulgariaSat-1 during a June 15 test. The rocket is scheduled to make its second spaceflight on June 23. SpaceX's Florida launch is scheduled to fly no earlier than 2:10 p.m. EDT (1410 GMT) on Friday from NASA's Launch Pad 39A at the Kennedy Space Center in Cape Canaveral. The Iridium satellite launch, meanwhile, is currently scheduled to lift off from Vandenberg's Space Launch Complex 4 at 1:25 p.m. PDT (4:25 p.m. EDT/2025 GMT). Earlier, Musk wrote that the BulgariaSat-1 launch delay was a safety precaution. SpaceX engineers needed time to replace a pneumatic valve on the fairing, the protective nose cone that covers the satellite during liftoff, but there was already a backup in place, he added. "Postponing launch to replace fairing pneumatic valve. It is dual redundant, but not worth taking a chance," Musk wrote. The BulgariaSat-1 launch will mark SpaceX's second flight using a used Falcon 9 rocket booster. It happens to be the same one SpaceX used in January to launch the first 10 satellites of the Iridium NEXT satellite constellation. The Iridium satellites launching Sunday on the brand-new Falcon 9 rocket will be satellites No. 11-20 of the NEXT constellation. SpaceX is expected to attempt Falcon 9 first stage booster landings for both of the upcoming launches as part of its reusable rocket program to lower the cost of spaceflight. SpaceX has landed Falcon 9 boosters 11 times so far, and even relaunched one of them in March. On June 3, the company launched its first reused Dragon cargo spacecraft, a robotic capsule packed with NASA supplies for the International Space Station. That Dragon capsule will return to Earth in early July.